The gansey is such a paradigm for knitters. It is the ursweater. A fisherman’s garment, it was as essential to fishing life as nets, hooks, even boats. You don’t say “gansey sweater,” just “gansey.” Its simple name conveys at once its nature, history, design, construction, and use. Gansey, apparently, is a Scottish version of guernsey. The OED gives the first published version of the word as 1886, in J. J. H. Burgess’s Shetland Sketches: “He rubbit aff da shute wi’ da sleeve o’ his gansey.” By 1922, the word was so well known that Joyce used it in Ulysses to describe Bloom’s fantasy through his fashion sense: “In workman’s corduroy overalls, black gansy with red floating tie and apache cap.” Gansey is certainly also a version of the word guernsey, from the name of a famous Channel island, and is likewise used to describe the guernsey shirt. The most famous ganseys come from the Yorkshire coast: Filey, Scarborough, Whitby, but were also made extensively in East Anglia, especially Sheringham. Frank Meadow Sutcliffe devoted much of his career as a photographer to the fisherfolk of Whitby, and his nineteenth-century images feature a kaleidoscope of ganseys in action. In addition to the many pictures of fishermen at work, Sutcliffe also took some wonderful portraits that offer us some great close-ups of gansey designs. His works are still within copyright, since he died in 1941, so I can’t post any, but several are available elsewhere online (see below). 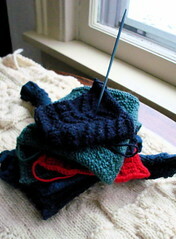 What makes the gansey so fascinating to knitters (at least to this one) is its construction. Full of challenging and interest-grabbing techniques from the get-go, the gansey begins with the Channel Island cast-on, incorporates side welts, textured pattern blocks, underarm and neck gussets, and shoulder-to-cuff sleeves into an all-in-one knit unit. Most of the features have very practical purposes: cast-on edges are strong, underarm gussets allow much more freedom to move (and haul in nets! 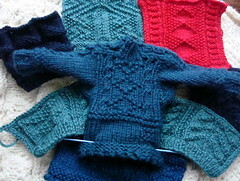 ), raveled sleeves can be re-knit from the cuff (where they get most wear), and because they are a solid color, there are no fussy ends to darn in. I love the thought that a fisherman could repair his own sleeves (by the way: don’t miss Sarah Orne Jewett’s story, “Along Shore,” from Country of the Pointed Firs; there’s a wonderful scene of an old fisherman knitting a sock—not British, perhaps, but still charming). 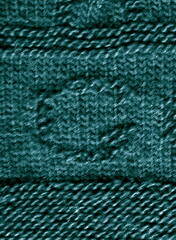 My favorite gansey tradition, not suprisingly, is the practice of knitting the wearer’s initials into the otherwise plain area towards the bottom of the sweater. 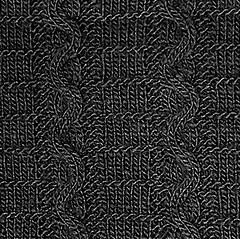 Texture in ganseys is achieved almost entirely through knit-purl combinations or through judicious use of relatively small cables. It is often suggested that particular towns developed very specific and identifiable combinations of textured patterns, so that one could identify a fisherman’s home town simply by looking carefully at what he was wearing. Biography, from the National Gallery of Art, Washington, D.C. I love Ganseys. I know now what will be the next on my needles !!! 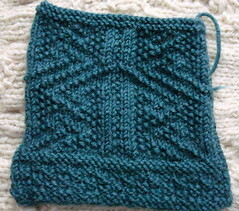 Agreed wrt ganseys being a pain to knit at such a small gauge. 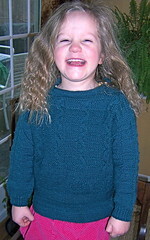 I remember knitting Sheilavig and how it took forever to knit, and poking holes in my fingertips because I had to go down to US0 or 1 needles. DO take a look at the Shetland Museum and Archives Photo Library.